I was talking to a friend, who was lamenting that they have not been able to go on a long retreat for many years for health reasons. So an idea occurred to me. Many people would like to do long retreat, short retreats, or even just a one day silent retreat. What's the barrier? What's to stop one from conducting a retreat of any length, without spending any extra money and traveling? Usually the lack of a supportive environment. One of the most supportive aspects of a formal retreat is having a community of fellow meditators meditating. Is it possible to build a virtual 24 hour meditation hall with no money down, no monetary expense at all, just tools we already own? 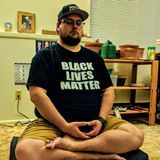 I don't use facebook (only to passively read a public qigong forum), but I do have an account for audtip.org for announcing new recordings. I'm going to create a group called "24 hour meditation hall". The idea is, when you vist the page, it should feel like a quiet oasis, a sanctuary, and place where people are quiety meditating and supporting each other (quiet emotional support). And since it's a virtual meditation hall, with international members from all time zones, in theory with enough visitors anytime you visit you see someone meditating. So basically just post something really short, so people know you're there. 1) John from england, going to a do a 30 minute sit. 2) Bob from canada, doing to one day silent retreat. I made a sign that I wear around my neck that says "I'm observing noble silence" so my wife and kids don't talk to me today. 3) Jane from new zealand, I going to do walkng meditation for 20 minutes. 4) mike from india: i'm too drowsy to meditate so I'm going to read suttas for 30 min. I guess the first step is you need to "friend" me so I have people do invite to the group. My facebook identity is "frank metta", contact@audtip.org, I own a page called "audtip.org". Is it possible to do this using say Skype? I do not have a face book account and I do not intend to crate one. So people can see each other. By the way, why cant we make this thread the 24 hour meditation hall? I am still learning facebook myself, but there are advantages to it. You could try using this thread, I'm open to using whatever platform is most viable. I have been strongly considering doing something like this for a while, but using a Google Hangouts platform so it's the equivalent of an "always on" video chat room, so different people could log in at whatever times and you would be able to see others practicing. Is this something I should move forward with? I don't want to duplicate efforts if other folks are working on it and will produce something similar. Fwiw, our Zen friends at Treeleaf Zendo do exactly this. We sit together for 30 minutes–feel free to drop in and leave at any time. I haven't tried it yet, but it sounds like a nice virtual format. And you put your webcams on so there won't be that "temptation" to get up and do something else, while you're sitting, as others might be watching (the group phenomenon which provides support). So it might have the feel of being at a real in-person Zendo / meditation hall. It won't be duplicating anything simple (and off the grid as much as possible) that I'm trying to do. And even if it is, since people are in different time zones, have different qualities of internet connection, I think it's worthwhile to try out. let us know how it goes. Buddha never said that we can have only one temple and one Dhamma forum. More the better as they produce a synergy effect. okay, here's what i've got at the moment: this link, which is a persistent Google Hangout. basically, if you click on it it will connect you with anyone else also clicking on that same link at the same time. what i am not sure about is how long it will last if no one is in it, but it's worth experimenting with. let me know (feel free to dm here) if it works or if there are problems.